Though born (and raised) in India into a family of doctors, Shilpa is afraid of germs. At the same, she is amazed by them and originally studied them. Shilpa acquired a BS and MS in Microbiology from YM Collage in Maharashtra. She then worked as a microbiologist in a major pharmaceutical company in the quality control department and took pride in ensuring best and safe drugs to consumers. Shilpa then took some time off to raise her daughter, of whom she is quite proud, until she was school age. 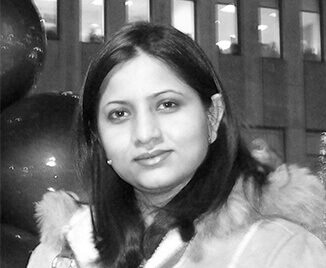 Shilpa recently re-joined the work force to pursue her dreams, and became Provisioning Assistant for s2s. At s2s she loves to help her team provide the highest quality service to customers. In her free time, Shilpa volunteers for a Non Profit Indian cultural organization and likes to spend time with family and friends. Shilpa also enjoys shopping and eating good food which benefits both body and brain.